Does anyone know the matrix difference between the original and reissue. I need help identifying a version I have of this. 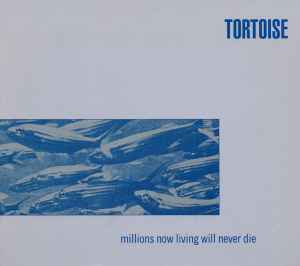 I have a copy that looks nearly identical to Tortoise - Millions Now Living Will Never Die, which I also have, that has a printed inner sleeve instead of the two sided card. The cover shows the school of fish, and does not have a bar code. Vinyl appears identical (same matrix) as Tortoise - Millions Now Living Will Never Die, too. It does not appear to be 2016 reissue of Tortoise - Millions Now Living Will Never Die, because my version is black vinyl, without bar code, and with the school of fish curving from the top to the bottom. It does not appear to be 2013 reissue of Tortoise - Millions Now Living Will Never Die, because my version has the school of fish curving from the top to the bottom. It might be the 2012 reissue of Tortoise - Millions Now Living Will Never Die, but the only picture for that version is the cover. Any help identifying would be appreciated. Unfortunately very bad pressing. Plenty of scratches, lots of pops. What is wrong with today's vinyl? My copy is like this but has Mould SID Code: IFPI 5205. Does anyone have an opinion of how this reissue compares to the 1st pressing? Is it just my copy or there are glitches in the first two tracks (DJed at around 20:03 and Glass Museum at the beginning)? Ripped using EAC and it was just like that as well.